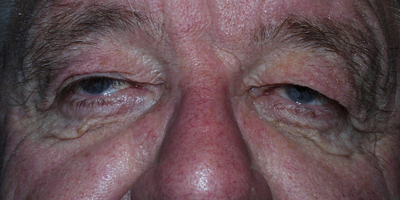 Ptosis is a droopy upper eyelid. A weakness in the muscles or the nerves that control the eyelid, as well as looseness in the thin eyelid tissue, allow the lid to sag. Ptosis can occur in one or both eyes and can vary in the degree of severity. In severe cases, the lid can almost completely cover your pupil. In such cases, your vision will likely be affected and you may notice that you tilt your head backwards to see more clearly. Ptosis can be congenital, meaning you are born with it or it develops during infancy, or it can be caused by aging, previous eye injury, or rarely, underlying disease. When ptosis is congenital, it can have an impact on a child’s vision. In severe cases, this can lead to amblyopia or a “lazy eye”. Amblyopia is an eye disorder in which the eyes and brain are not working together for proper vision. The droopy lid prevents your child from seeing clearly. In effect, the brain “turns off” the image from that eye to prevent blurry vision. If you notice that your child’s lid is drooping, you should discuss the situation with your pediatrician, as this could be a symptom of a more serious medical disorder. Most often, ptosis is caused by a weakness in the tendon that attaches the levator muscle to your eyelid and occurs as part of the normal aging process. The tendon weakness may not be apparent, as the sagging in the lid can occur very gradually. In some patients, cataract surgery can cause an already weakened tendon to separate from the muscle. There are other risk factors for ptosis including diabetes, stroke, and a brain tumor, as well as a rare disorder, called Horner’s syndrome. If the symptoms of ptosis come on suddenly, you should immediately contact your doctor, particularly if accompanied by other symptoms of a stroke. Initiating treatment for a stroke within the first three hours is critical to minimizing its impact. It is equally important to quickly identify any other neurological cause of sudden-onset ptosis, so that prompt treatment can be initiated. Ptosis is detected during a comprehensive physical or eye exam. If your primary care doctor notices a droopy eyelid during your physical, he may conduct additional tests if he suspects that the ptosis is caused by an underlying disease or neurological problem. The treatment of your ptosis will depend on the underlying cause and the severity of your symptoms. If the ptosis is caused by an underlying medical disease or disorder, treating the cause may improve the symptoms. With respect to congenital ptosis, surgery may be required to prevent the vision problems associated with amblyopia. Depending on the severity of the drooping lid and its impact on vision, the procedure can be done at an early age. However, better outcomes may occur when the child reaches about age 3. If your ptosis is related to the natural aging process, a minor surgical procedure called blepharoplasty may be required, particularly if your vision is impacted. This outpatient surgery involves removing a small portion of excess skin, and tightening the supporting muscles and tendons. Our board certified ophthalmologist who has also done a fellowship in oculoplastic surgery, performs blepharoplasty to achieve the best acceptable cosmetic and functional result. He will review the appropriate treatment options with you. During this procedure, you will feel little or no discomfort. On the day of treatment, a staff member will welcome you. The staff will help you prepare for your surgery by putting eye drops in your eye. You will be given a gown to wear over your street clothes during your actual surgery. Immediately after the surgery, you will rest in a comfortable reclining chair. Your family members may then join you in reviewing your follow-up care and schedule. You may be given eye ointment, or eyedrops to prevent infection.You will need a driver if you are sedated. Some potential complications from surgery include the risk of bleeding, infection and hematoma, which can usually be successfully treated. In addition, a small number of patients may have temporary or permanent difficulty in fully closing their lids when they sleep. In such cases, special ointments or drops may be used to maintain lubrication in the eye.